The more peat and smoke, the better. While I have yet to encounter one that is an utter disappointment, Irish whiskeys that blow my mind are few and far between. The milk chocolatey nuances of Bushmills Single Malt Whiskey 10-year-old is a gateway into Irish whiskey territory that I find rarely entered. The heavily sweet yet soft Bushmills Single Malt Whiskey 16-year-old is something that truly hits the pause button as one finds it difficult to put an end to it caressing one’s palate. 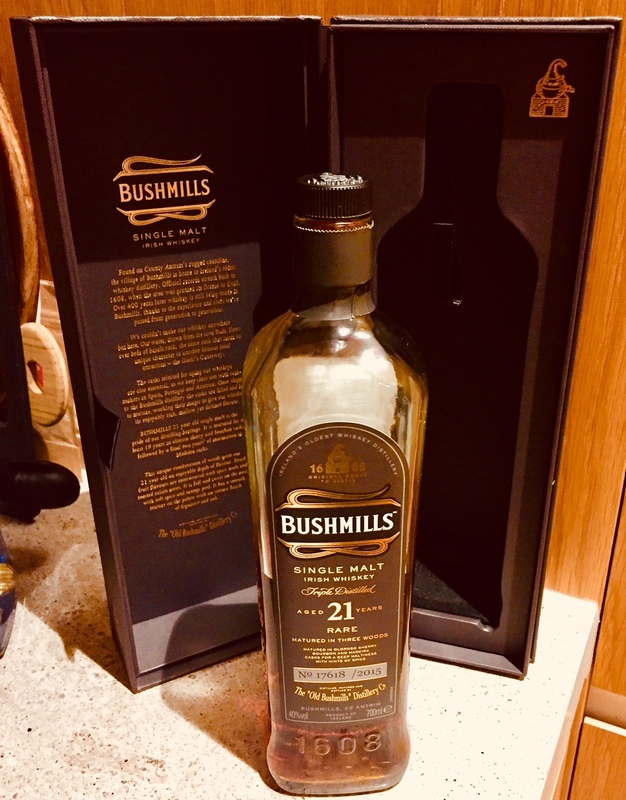 However, Bushmills Single Malt Whiskey 21-year-old plays in a league of its own: Learning that it has been matured in a mixture of Oloroso Sherry and Bourbon casks, before a two-year marrying period spent in Madeira casks sets high expectations. Expectations that are exceeded ones it is uncorked. It is rare to find whiskey with such a delicate nose as the nostrils are tickled with hints of honey, marzipan, musty oak, almonds and grapey wine notes buried in the back that make one salivate straight away. With malt nuances that serve as a foundation for the claviature of spiciness, hints of Sulphur, raisings and a pronounced nuttiness, the thick and creamy 21 -year-old melts in your mouth in a manner with waves of caramel, feint ginger, creamy toffee and subtle tobacco notes that redefine mellowness and is in some aspects reminiscent of what I get out of a smooth Michter’s Bourbon. One hell of a complex full-bodied drop from start to its dry finish with a deliciously malty and spicy aftertaste and a mesmerizing one for special occasions – if you ever fell prey to the notion that Irish whiskeys lack the multi-dimensionality that is found in scotches, you will find yourself converted with this finely-calibrated exercise in aromas and flavours.